This meeting underscores the recognition, throughout the nation, that American manufacturing matters. Here are some of the top-line pointers that every manufacturing company can use. High schools and colleges are looking for ways to help support the industrial sector by providing the skill sets needed in the workforce. Don’t be afraid to become engaged with these educators to help find solutions to the “STEM Skills Gap” that has plagued our nation. Using government resources is not a new concept. Large corporations do it all the time. Smaller manufacturers should also take advantage of local and state programs that are targeted to manufacturing companies. They can range from loan programs to bond funding to tax credits for employee hiring and training. Harry Moser, President and Founder of The Reshoring Initiative, says locating closer to your customer base is a win-win. You can respond to their needs more efficiently and with better quality. And, the skilled manufacturing professionals that are required to build American products will contribute to re-building our middle class. In fact, each manufacturing job creates 2.9 jobs in other sectors. Manufacturing is a priority for Montgomery County and the nation. And, it should be. In 2013, manufacturers contributed $2.08 trillion to the economy. Need more proof on why manufacturing matters to American. 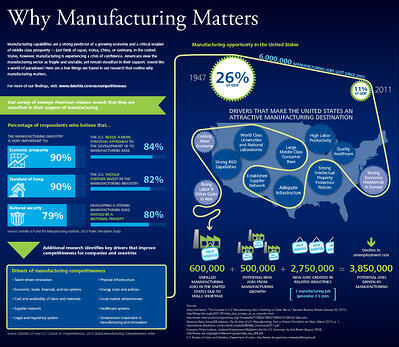 Take a look at this new infographic from Deloitte’s Manufacturing Competitiveness Hub. Sources: Manufacturing Extension Partnership/U.S. Department of Commerce; National Association of Manufacturers (NAM), Deloitte. Want to find out more about the benefits of reshoring? Download our whitepaper.